LAS VEGAS, NV – February 28, 2012 – Winners in the Sixth Annual Stevie Awards for Sales & Customer Service, an international competition recognizing excellence in disciplines that are vital to business success, were unveiled last night at a gala ceremony in Las Vegas, Nevada. The Stevie Awards for Sales & Customer Service is the world’s leading sales awards, customer service awards, and contact center awards program. For the first time, Stevie Awards were conferred in three levels of distinction: gold, silver and bronze. Previously, only overall category winners have received Gold Stevie Awards. Zions First National Bank won three Gold Stevie Awards, more than any other organization in the competition. Winners of two Gold Stevie Awards are Avaya, Cloud9 Analytics, Direct Alliance, ING Direct USA, iolo Technologies, and PetRays Veterinary Telemedicine Consultants. Other notable gold winners included Boeing Commercial Airplanes, FedEx, Groupon, OnStar, Twitter, UPS, and Warner Bros. International Television Distribution. 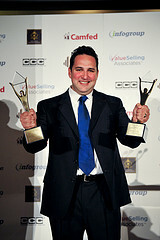 Winners of the most Stevie Awards in all levels included John Hancock Signature Services with 14, DeVry University with 11, and Marriott Vacation Club International and Coloredge Los Angeles * New York with 10 each. 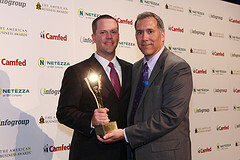 A complete list of all honorees by category is available at www.StevieAwards.com/Sales. Winners in the third annual People’s Choice Stevie® Awards for Favorite Customer Service, as determined by more than 250,000 public votes, were also awarded at the event to organizations including Apple Inc./Apple Stores, Amazon.com, eCornell, Finding Freedom Team, InterContinental Hotels Group, Photodex, SquareTrade, Rosetta Stone, India’s TATA Motors Ltd., and Vodafone Turkey. The presentations were broadcast live by the Business TalkRadio Network (http://www.businesstalkradio.net), and the recording will be available online in the coming weeks. The awards are presented by the Stevie Awards, which organizes several of the world’s leading business award shows including the prestigious International Business Awards. More than 350 professionals from around the world attended the event. More than 1,000 entries from organizations worldwide were submitted to this year’s competition, an increase of almost 30% over 2011. Finalists were determined by the average scores of 93 professionals worldwide, acting as preliminary judges. Entries were considered in 27 categories for customer service professionals, including Contact Center of the Year, Award for Innovation in Customer Service, and Customer Service Department of the Year; 38 categories for sales professionals, ranging from Senior Sales Executive of the Year to Sales Training or Coaching Program of the Year to Sales Department of the Year; and categories to recognize new products and services and solution providers. More than 100 members of seven specialized judging committees determined Stevie Award placements from among the Finalists during final judging, January 30 - February 10, 2012.
Who's Coming to the Stevie Awards Next Week? We're expecting a record attendance - a sellout of 360 - for the 6th annual Stevie Awards for Sales & Customer Service on Monday, February 27 at Caesars Palace in Las Vegas. 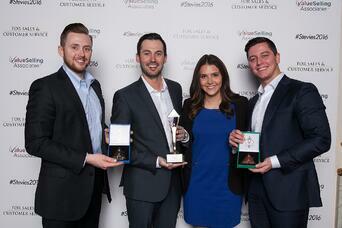 These are the world's top sales awards, contact center awards, and customer service awards. This will be the historic first-ever ceremony at which Silver and Bronze Stevie Award winners will be announced. We've introduced Silver and Bronze Stevies this year as part of our celebration of the 10th anniversary of the founding of the Stevie Awards movement. Henceforth all honorees in Stevie Awards programs will be Gold, Silver or Bronze Stevie winners. Today, January 18, is the final entry deadline for the 2012 (6th annual) Stevie® Awards for Sales & Customer Service, the world's premier customer service awards, contact center awards, and sales awards. If you have not yet requested your 2012 entry kit, you can download your entry kit here. For your convenience, we have also made a helpful video tutorial on how to successfully enter submissions here. 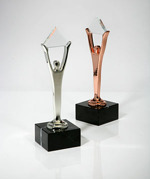 All 2012 sales awards and customer service awards Finalists will be notified on January 25th. As part of our 10 year anniversary celebration, Finalists will be recognized as Gold, Silver or Bronze Stevie Award winners. Winners will be announced at the 6th annual sales and customer service awards banquet at Caesar's Palace in Las Vegas on February 27th. If you have questions about the 2012 Stevie Awards for Sales & Customer Service, please email us at help@stevieawards.com or call us at +1 703-547-8389. Organizations and individuals worldwide are invited to submit entries. There are dozens of opportunities to win for both private and public organizations, small and large organizations, and non-profit and for profit organizations. The 2012 competition will recognize achievements since July 1, 2010.
Review all of our sales awards and customer service awards categories. We have more than 90 categories honoring sales excellence and customer service excellence for individuals, teams, and departments, plus new categories this year for products, service, and solution providers. Select the categories you wish to apply for, write your submissions according to the instructions, and submit your entries. All Finalists in the Customer Service Department of the Year categories will automatically be included in the People's Choice Stevie Awards for Favorite Customer Service, a worldwide public vote that will commence on January 26. Finalists in the Customer Service Department of the Year categories will have an opportunity to win two awards: a Stevie Award, as voted by your peers, and a crystal People's Choice Stevie Award, as voted by your customers. The Sales and Customer Service awards banquet will be the first to showcase our three levels of award distinction: gold, silver and bronze Stevie Awards. You can learn more about the new awards here. There's only a short wait to find out if you and/or your organization is a finalist. All Finalists will be notified on January 25. Watch our helpful video tutorial on how to successfully enter submissions here. Review past winners' entries here. These are great examples of entries that were judged highly in the 2011 awards. Make your entries count: learn how to submit winning entries here. Still have questions? Call us at + 1 703-547-8389 or leave us a comment and we'll get back to you right away. Why Give the Gift of the Stevie Awards? The Stevie Awards are the world's premier business awards. Not only does a nomination represent appreciation and a recognition of success, but all Gold, Silver and Bronze Stevie Award winners will be recognized on a national and international scale- an invaluable gift! Get your entry kits for the Stevie Awards for Sales & Customer Service and/or The American Business Awards. The Sales & Customer Service awards are open to all organizations and individuals worldwide, with an entry deadline of January 18. The ABAs are open to all organizations and individuals in the U.S.A., with an entry deadline of March 28.
Review all of our awards categories. We have scores of sales awards and customer service awards categories as well as hundreds of business award categories. Select your categories and write your nominations according to the instructions. 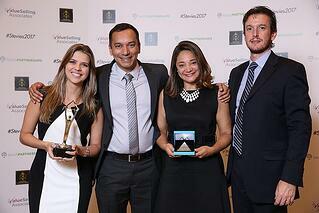 Understand the value of your gift: Learn more about the importance of corporate awards. Make your nomination a winning one: Read How to Submit Winning Entries. Know what to say: Review past Sales and Customer Service awards winners' entries here and past American Business Award winners' entries here. Still have questions? Call us at 703-547-8389 and we'll help you get started! Happy holidays to you and yours, and best wishes for continue success in the New Year! How will you use a Stevie Award nomination to reward those in your organization?